18 km off the coast of Auckland you’ll find the idyllic little sanctuary that is Waiheke Island. It’s a destination that’s quickly become a popular getaway spot for locals and visitors alike. Known for its tropical subclimate, world-class vineyards and pristine beaches there are a plethora of fantastic things to do on Waiheke that everyone can enjoy. Archery and clay shooting might not be the first thing you think of when it comes to Waiheke. It’s something you can do however when visiting Wild on Waiheke. They’re a winery and brewery, first and foremost, with great food on their menu as well. The archery and clay shooting are bonus activities which you can add and are great fun. It’s a popular venue for hen/stag dos, team building days or just for sharing a laugh with family and friends. Many great Kiwi artists have called Waiheke home at some point in time and a good number reside there still. The great thing about this is that their art can be seen and appreciated from one side of the island to the other. Oneroa Village is the place to start with galleries like the Waiheke Community Art Gallery and the [Space] Contemporary Art Gallery. There are also plenty of artist studios across the island that you can visit. This includes the likes of Kauri Artist John Freeman and landscape artist Gwen Rutter. If you’re into a bit of cycling, be it casual, recreational or a bit more serious, you can definitely do it on Waiheke. There are a number of well-signed and increasingly popular cycling trails/mountain bike tracks on Waiheke. The first are the Rangihoua Mountain Bike Trails which go from grades 2-4 with rewarding views of the island. There are also a few more in the Whakanewha Regional Park. If you don’t own your own bike you can always hire one when you get there including e-bikes from places like Bikes & Barbers. The beaches on Waiheke Island are amazing and has probably been the biggest drawcard of visitors to the island over the years. There are so many great ones to choose from like Oneroa Bay, Sandy Bay, Enclosure Bay, Onetangi Beach, Palm Beach, Man O War Bay and more. Each has their own unique characteristics but all are glorious places to be and relax on a hot sunny day. Waiheke is also a place you can experience culinary delights with some fantastic restaurants and vineyard restaurants to dine at. With a bounty of fresh seasonal produce to choose from and some talented chefs to boot, you’re definitely spoilt for choice. It’s hard to go wrong here but a few places we love include Te Motu’s The Shed, Casita Miro and The Oyster Inn. If you’re into your water sports or have an interest in trying then the prospect of jet skiing may appeal. A great way to do this is on a tour with a local provider like Waiheke Island Jet Ski Tours. The benefits of this are, not only being looked after while you’re on the water but getting the invaluable local knowledge. This means you’ll get taken straight to all the best spots as soon as you’re underway. Some of these can’t be reached on land too which makes it all the more special and unique. If you’re into water sports that are a little more easy-paced then jet skiing, kayaking and/or paddleboarding are a good compromise. We’ve already talked about the superb beaches which provide some great spots to take your kayak and/or paddleboard out on the Hauraki Gulf. Again, there are some great providers like Kayak Waiheke who hire out kayaks and SUPs by the hour. They also do Sea Kayaking tours for the more adventurous which is a fun option as well. One of the more unique experiences you can have on Waiheke is to visit one of their Olive Groves like the excellent one at Rangihoua Estate. The Rangihoua Estate is a wonderful success story which started in 1997 as a small operation. It’s since blossomed into an olive grove of 4,200 trees producing award-winning olive oil. Visitors are welcomed 7 days a week and can go on olive tours where they’ll see the trees, learn about the harvesting techniques and experience tastings! We’ve already mentioned the talented artists that live and work on Waiheke and a further tribute to this is the impressive sculpture park at Connells Bay. The park is a great way to spend a few hours with a 2km track that showcases over 30 sculptures. Some great NZ artists are represented with works made from a range of materials including aluminium, bronze, stone and wood. The biggest of them all is over 8m high and you’ll also enjoy fantastic views of the surrounding areas. You might have thought we were done with the water sports but we’re not as we move onto scuba diving and snorkelling! It’s a pursuit that makes sense in Waiheke with its crystal clear waters and abundant sea and marine life to appreciate. Once again, there are some great local providers like Waiheke Dive & Snorkel that do just about everything from gear hire, courses, guided trips and even night dives too! If you’re a lover of the great outdoors then Whakanewha National Park is one that should be high on your Waiheke list. The park is an area of mature coastal native forest with a network of walking tracks (the longest of which is 2.5 hours) to explore. You’ll see some fantastic flora and fauna as well as some stunning NZ birdlife as well including kereru, piwakawaka and tui. As well as this you’ll see historic Maori Pa and European settlements and if you want to stay longer there’s a camping ground there as well. You were probably wondering when we’d get to the wine tasting and the answer is now as it’s definitely one of the big must-dos on Waiheke. Waiheke’s well-known microclimate and alluvial soils meant it was identified early as a good spot to grow grapes. From that sprung an array of excellent vineyards with 30+ wineries operating on the island. Most of these, like Mudbrick, Cable Bay and Tantulus Estate have Cellar Doors that you can drop in on for a tasting (or two). They also often have magnificent restaurants as well where you can match the perfect wines with the perfect meal. A great one for the Waiheke list (and your bucket list) is ziplining, operated by the good people at EcoZip. For those who don’t know, ziplining is a thrilling activity (similar to a flying fox) where you are connected by a harness to wire, zipping from one treetop to another. EcoZip has three zip lines, the fastest of which will have you travelling above 50kmph. If you’re able to contain your excitement, you’ll also have the amazing views from your elevated position to enjoy on your way down. The other great thing about EcoZip is that they’re a GO Play partner which means our customers enjoy a 10% discount! 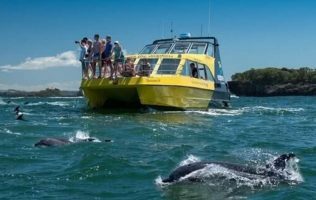 Some fantastic things to do on Waiheke! As you can see, there is no shortage of awesome things to do on Waiheke. We hope this list has inspired you to make that long overdue visit which is only a short 35-minute ferry from Auckland. You can also take your GO Rentals car too on the Car Ferry from Half Moon Bay making your travel around the island that much easier! Where in New Zealand should you visit this summer?